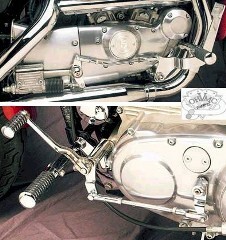 Product Listing - 0101 - Evolution Sportster Forward Controls. Available in two versions to fit all XL models from 1986 - 2003. Each kit includes all the necessary brackets, pedals, linkage, O-ring pegs, hardwareand detailed instruction sheet to both brake and shifter to forward mount style. Select the year model application needed from the option menu below.